I didn’t get to do a whole lot of biking today, unfortunately, a bit of a bummer on this wildly beautiful spring afternoon in Baltimore. I had a longstanding appointment to bring my bike into the shop for some fancification, which meant enforced time sitting still. I didn’t like it, but I have needed it, and afternoon spent trying to concentrate again. And then I got the call from the bike shop–the Surly was ready for pick up–and off I headed to get the bike for a quick pedal. I meant to ride over to Penn Station–I had heard students were organizing there, I’m a teacher, so I thought I’d see what was up before biking back home to empty out the ol’ work bag. What I saw at Penn Station kept me there, though. There was already a significant crowd forming–the first time I’ve been at a rally that started on schedule, much less early, and I’ve been going to these things since I was a tiny girl. I saw lots of folks I knew–current and former students, Spilly (who is running for mayor, and we might well be in the market for a new one), and a whole bunch of friends I haven’t seen live and in person in a long time, a reminder of how rarely we come together as a community off the internet anymore. 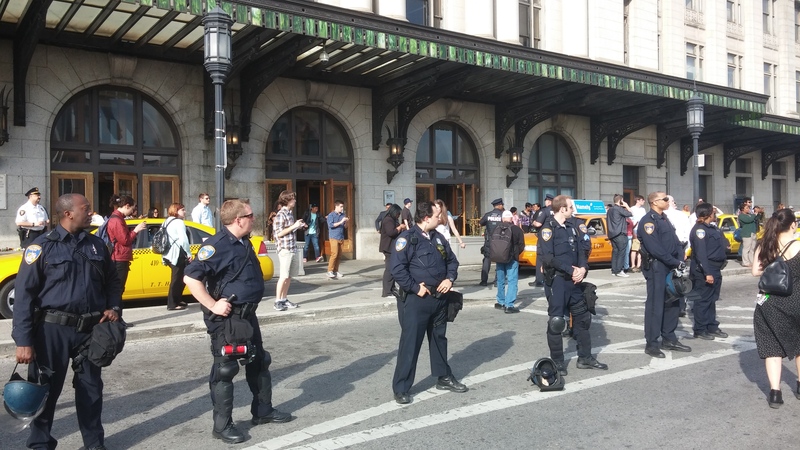 I snapped this picture of the police lined up between the protesters and the front doors to Penn Station. I instantly assumed they were blocking the way, that if I wanted to go inside the station to, say, get a donut or use the bathroom or drop a banner, I wouldn’t be able to do so. Cops are everywhere in this town right now, and they’re standing in front of places that the public has a right to go–this station, the Inner Harbor, around the grassy block in front of City Hall. These are our spaces, and it surprises me how quickly I give up my sense that I have a right to them, that I have to remind myself that just because they’re standing there with their guns and batons and restraints doesn’t mean I can’t use the bathroom in the public train terminal. I’m “the public” until they are there, interpellating me as an outsider, a troublemaker, someone to be kept out. It’s like when you’re driving on the freeway and you see a cop–you slow down, panic just a little, even if you know you’ve done nothing wrong–the panopticon works, and when it’s staring right at you, well, you suspect you might be suspect, even when you know better. I thought about this as the march began, spilling off the sidewalk and into the street, the crowd big enough to take all the lanes. And I wondered why the cops kept their distance this time, unlike on Monday in the mall parking lot with a much, much smaller group of African American high school students. Why was our right to space in many ways respected, but not theirs? The answer’s not all that complicated, and it has everything to do with race, class, and permits. That’s an awfully old story, too. And then we walked and walked, chanted and walked, and then stopped for pizza before walking and walking back to our bikes for the ride home. It’s good air out there tonight. I hope everyone got to take a breath. This entry was posted in police and tagged Baltimore, Penn Station, police, public space. Bookmark the permalink.